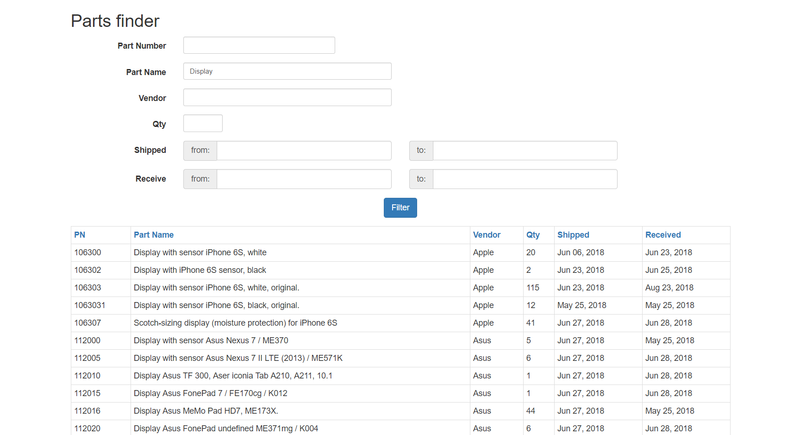 Parts Finder — this is single page web application. If none of the filter fields is specified then all Parts should be shown. The table can be sorted by any of the columns by clicking on their header (one click — ASC order, next click — DESC order). Sorting performed only by one column at a time. When user uses sorting — filtering is still applied. The general purpose is not to use ORM and Spring. Using classic Servlets, JSP, JDBC. Datasource setting in database.ini. See more details for install in manual.